Each box is themed – this box was themed “Legends and Lore”. 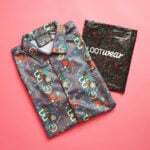 This delivery includes one of my favorite t-shirts and some great artwork. The box unfolds to have a little bit of a display for your Harry Potter goodies. This new pin series is just awesome. 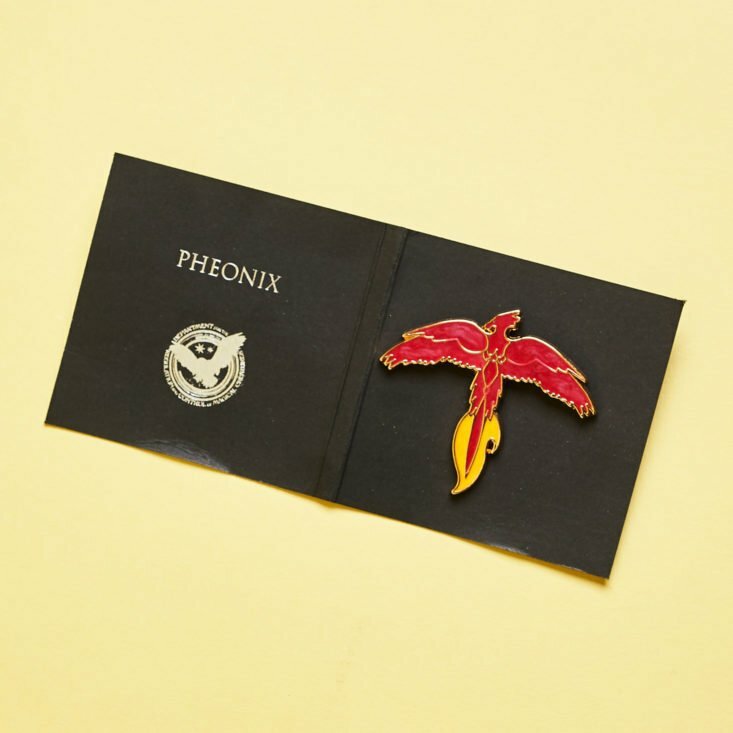 We received Hedwig last month – and this month brings Fawkes the Phoenix. Deathly Hallows T-Shirt – value $15? This might just be my favorite shirt from this subscription yet. I am loving the daunting color scheme and imagery – everything about it is just pretty darn cool. Mirror Of Erised Mirror – Value $10? At first, I thought this had a magnet backing, but that wasn’t the case. The Mirror of Erised shows you your deepest desire – so you can check in with this mini version as often as you’d like. Hogwarts House Prints – Value $20-25? Each house gets a representative print of the legend behind the name. I love the artwork and color on each of these – and I think they might be even better displayed together. Hogwarts Umbrella – Value $15-20? Finally, the last item takes us back to Hogwarts one more time and gets you prepared for those rainy days with a house crest umbrella. Overall, it does feel like a high-quality umbrella with a really nice grip. Verdict: I’m into this new pin set even more than the Horcrux set – I think the design and colors have been really great so far. This month’s shirt was a big winner for me, I really liked the prints, and can always stow away an umbrella for a rainy day. The only item I wasn’t really into was the little mirror – but 4 out of 5 ain’t too bad. What do you think of the November 2018 ‘Legends and Lore’ J.K. Rowling’s Wizarding World Crate? It’s nice that Loot Crate is at least getting some of their boxes out (nearer) to their correct timing, but it’s becoming increasingly obvious that they’re using both Star Trek and Firefly customers to bolster vendor payments for their other franchises. Both Trek and Firefly are now THREE full crates behind (Trek may even be four, unless their new revised date for the MARCH box actually does come out before the end of December), AND they’ve just charged as normal (on December 15) for the next Firefly crate, even though they’re already three behind as it is. Yes, I’m a sucker for keeping up my end of the subscription bargain, but geez Loot Crate, what are you as a company that you think it’s okay to do this to a loyal customer base? I’m glad I wasn’t the only person disappointed the mirror wasn’t a magnet! This is a nice box….I would have loved to have gotten this one…..but I am so over Loot Crate’s shipping issues……. It’s spelled phoenix, not pheonix. That misspelling on the package is pretty tacky.